WASHINGTON (Sept. 10, 2009) -- On the eve of the eight-year anniversary of 9/11, Pentagon employees who witnessed that tragedy first-hand took time to reflect from inside the memorial built to commemorate that day. 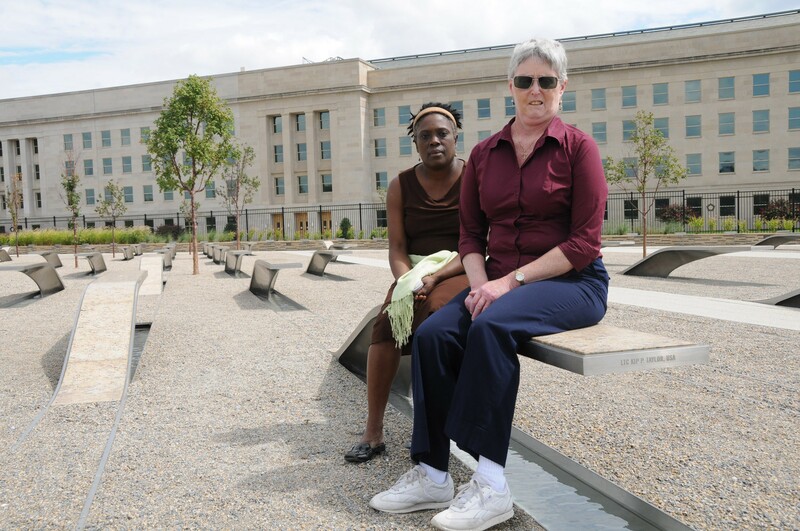 Mary Lou Bradley and Aline V. Tyler, both Department of the Army civilians with Army G-1, spent the latter portion of their lunch hour sitting on and walking amongst the 184 granite and stainless steel benches that represent the victims of the attack on the Pentagon. Mary Lou Bradley and Aline V. Tyler, both Department of the Army civilians with Army G-1, spent the latter portion of their lunch hour at the Pentagon Memorial, sitting on and walking amongst the 184 granite and stainless steel benches that represent the victims of the attack on the Pentagon. The memorial was dedicated Sept. 11, 2008. Both Bradley and Tyler had been in the building the day the plane hit. "When the plane came though, I felt the building move off the foundation," said Tyler, a Pentagon employee for 21 years now. "It threw me on the ground. Then I was looking -- it was smoke, like a cloud. It was the E-ring wall. It frightened the life out of me. I didn't know what to do. Then the military came out and came to my rescue -- the Soldier could tell by my expression that I was in a state of shock." But eight years later the day was beautiful: blue skies, puffy white clouds and temperatures in the 70s. Bradley and Tyler were talking, remembering friends, and enjoying the tranquility of the new memorial, dedicated just one year ago. "This is absolutely beautiful out here," said Bradley, who's worked at the Pentagon since 1982. "I just felt like I wanted to come out here today. This memorial is beautiful -- it's a tribute to all the people who lost their lives on 9/11, both on the plane and in the Pentagon." Tyler visits the memorial after work, she said, often with friends. "Sometimes I come with another person that experienced 9/11 and we will sit back and talk and -- it's peaceful listening to the water and sitting on the bench. It gives you closure," she said. "The trees are growing and it puts a smile on my face when I come out here. And the water has life to it, it seems like." Bradley sat with Tyler on a bench bearing the name of a friend lost in the terrorist attack. Col. Kip P. Taylor had been the executive officer for Lt. Gen. Timothy J. Maude, then the Army deputy chief for staff personnel. Both officers were lost in the attack. "He was a really nice guy," Bradley said of Taylor. "He had a nice sense of humor. He had one of these personalities where he just had friends all over the world and the office. People would come back to see him. I really liked him and got to know him." Remembering friends is why Bradley said it's important to come out to the memorial. She's recently been troubled by health issues and requires a walker now to get around -- so walking the distance to the memorial is difficult. But, she said, it's important. "It's hard for me to get around now, but I suggested coming out today," she said. "It's nice to come out here; it's peaceful; you get a chance to reflect, and we still miss them and wish they were here with us."